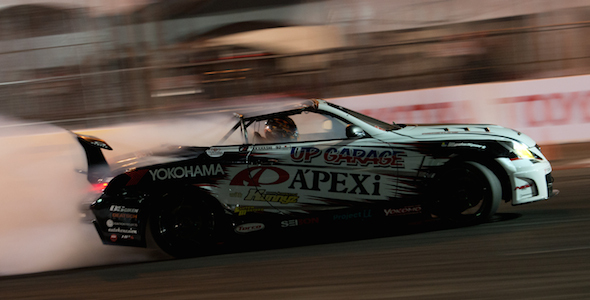 ORANGE, CA – The 2014 Formula Drift season kicks off a new season with a new beginning for the A’PEXi Racing team with seasoned D1GP driver, Kuniaki Takahashi behind the wheel of the Lexus SC430. During this offseason, the crew was at work making changes to the SC430 machine that were geared towards Takahashi-san’s vehicle settings, including converting the vehicle to right-hand drive to assure the driver acclimation process to be as efficient as possible. Takahashi is known for his aggressive “all out” driving style driving Toyota chassis’ such as the JZX100/ Mark II and his current vehicle in the D1GP series, a Toyota Mark X, he is no stranger to the Lexus SC430. The twin-turbocharged Lexus SC430 on Yokohama ADVAN Neova AD08-R tires put down a couple of practice runs during practice, but unfortunately ran into mechanical issues during the session, and the crew hustled to get the machine back out on track in time for qualifying sessions, however, the limited seat time was not enough to result in a Top 32 qualifying score out of an estimated field of 60 cars. On the following weekend, the team was back out for the Motegi Racing Super Drift Challenge during the Long Beach Grand Prix weekend, Qualifying in the 11th position, and faced up against 2013 Formula Drift Champion and Yokohama Tire teammate, Michael Essa in his turbocharged BMW 3-series. 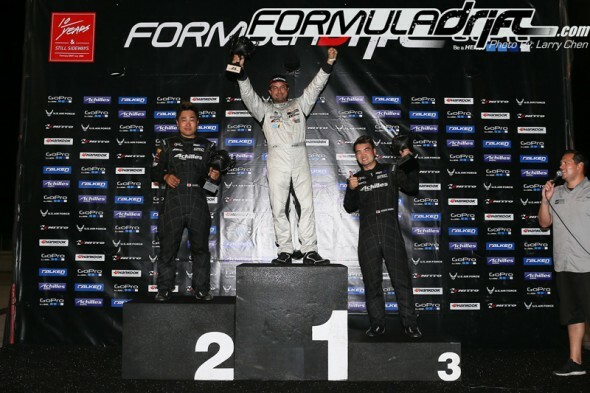 Though, not able to advance into the Top 8 competition bracket, the potential of the vehicle with Kuniaki Takahashi behind the wheel was witnessed immediately during the tandem Top 16 round, and the team is anticipating a successful 2014 season. During the back to back competition race weekends we were proud to introduce this year’s team and partners: A’PEXi Racing x Up Garage x Yokohama Tire with Kunny’z, rest assured that the team is hard at work preparing the SC430 to be the dependable and competitive machine that it has lived up to be the past few seasons. In addition, to developing and dialing in the vehicle to Takahashi’s specifications. We would like to thank all of our 2014 partners for their continued support as the team gears up and prepares for the upcoming Formula Drift Round 2: Road to the Championship event hosted by Road Atlanta in Braselton, GA on May 9-10, 2014.